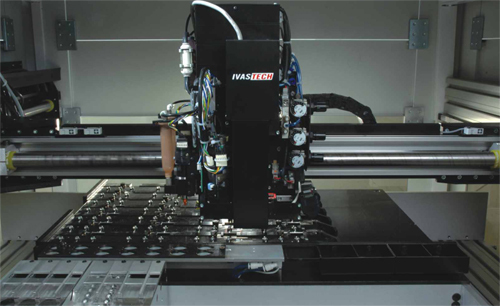 IVAS Tech is proud to present the most advanced multi-functional hot bar soldering system. Luxeon is an energy efficient and ultra compact light source. They combine the lifetime and reliability advantages of light emitting diodes with the brightness of conventional lighting. Due to their relatively low recommended storage temperature the standard reflow soldering process for array assembly can not be applied to them. For this reason the Luxeon’s manufacturers recommend a hot-bar soldering method. This is a process that transfers the heat only to the pins of the LED and avoids overheating the emitter and lens of the device. HBSM is a highly efficient and cost effective system for automated consecutively assembly and soldering of Luxeon type diodes. Our class of production equipment reflects the industrial developments and quality requirements of high-end equipment manufacturers at a fraction of the capital investment. We use maintenance free Linear motors for X and Y axes movement, proven to be the best in the industry. Implemented into the pick and place head are the glue and flux dispensers, an”on-the-fly” digital CMOS camera and hot bar tips. In the HBSM soldering temperature, speed of movement and pressure of the soldering tips are adjustable with fine precision. The tips generate a high energy density heat in a short timeframe, preventing opens and shorts. A specifically designed nozzle ensures damage free pick – up of the Luxeon LEDs and holds the component firmly in precisely during the placement and soldering process. Two Archimedean screw dispensers attached to the head deliver precisely controlled amounts of adhesive and flux. In spite of its small footprint, the HBSM will provide you with a big performance / price ratio for Luxeon LED automated placement and soldering; allowing you to implement an accurate repeatable cost effective process.